Collins Booksellers - 2nd Karl Schwarzschild Meeting on Gravitational Physics by Piero Nicolini, Matthias Kaminski, Jonas Mureika & others, 9783319942568. Buy this book online. 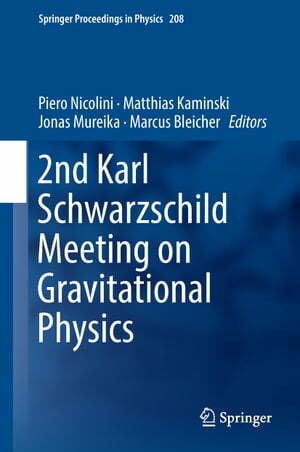 This book presents the proceedings of the 2nd Karl Schwarzschild Meeting on Gravitational Physics, focused on the general theme of black holes, gravity and information. Specialists in the field of black hole physics and rising young researchers present the latest findings on the broad topic of black holes, gravity, and information, highlighting its applications to astrophysics, cosmology, particle physics, and strongly correlated systems.